I have never been into buying accessories, in particular bags, that have been created in order to look like a designer style. I was once bought a Chloe lookalike from Thailand as a pre-teen and although I loved it, I don’t think I ever really realised that the bag was in the style of a fancy super expensive designer handbag. My dad brought them home as a little present for me and my sister from his holiday and we loved them purely because they made us feel like adults strolling around with our brightly coloured handbags. I feel like having the right handbag can make such a difference to how well put together you think an outfit is...at whatever age. Now I am older, I feel like I have such a sensible/boring attitude to buying accessories as I want them to be multi-functional. Buying a bag for me is ordinarily a big decision as I have to think about whether it would be suitable for both weekdays at work, and also the weekends. When I make a decision to buy a handbag it tends to be a lengthly process and I am happy to spend a bit more money on a better quality handbag so it lasts longer. 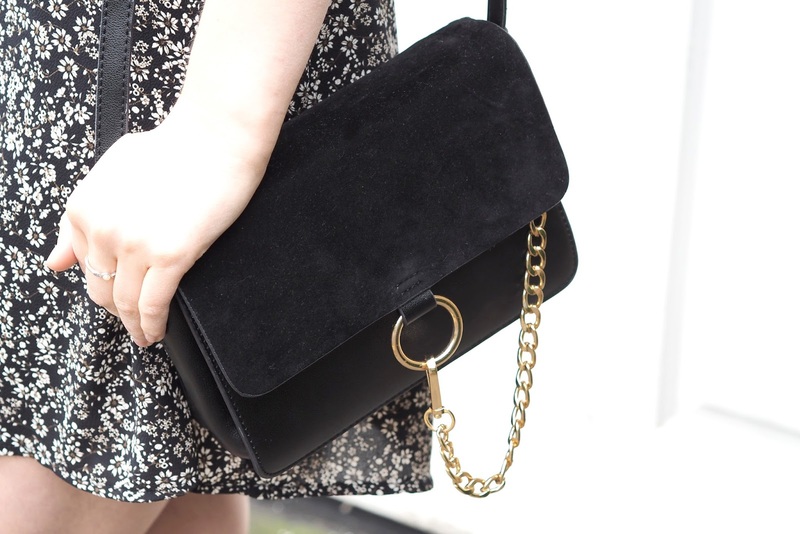 Recently I went completely against everything I normally do and bought myself a cheap little over the shoulder bag from Ebay...and I don't regret it at all! I used to be a big Ebay lover, but I stayed away from it for a couple of years because I realised I was spending far too long scrolling through items that I knew I was never going to buy. I've realised that the trick to finding a bargain is to only go on Ebay when you have decided what you are looking for. 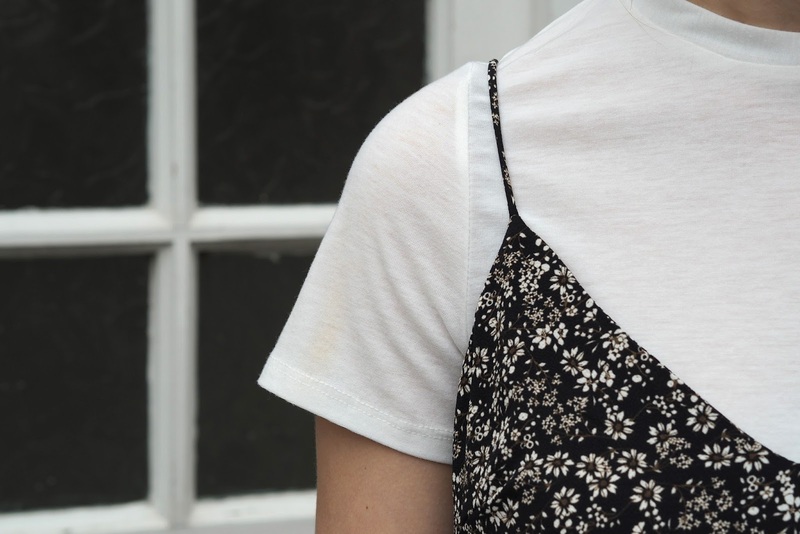 Searching for 'women's tops' and hoping you'll find items that look similar to what you saw in New Look a few days ago is completely unrealistic. You need to know what you want and then type in specific search words and without fail you will find something close to the item you are looking for. One of my favourite bloggers is Victoria from the blog VIPXO in Nottingham as she has completely transformed my view of shopping on Ebay. Victoria does fantastic weekly round ups of items that she wants that she has seen on Ebay and bundles them into blog posts called her 'Ebay Wishlists'. She covers clothes, accessories, homeware...you name it. Now I have to admit that not all of her items are my cup of tea, but normally there are at least one or two items that I click on to check out how cheap they are! Last month I was looking at her weekly wishlist and I saw that she had posted about this bag. 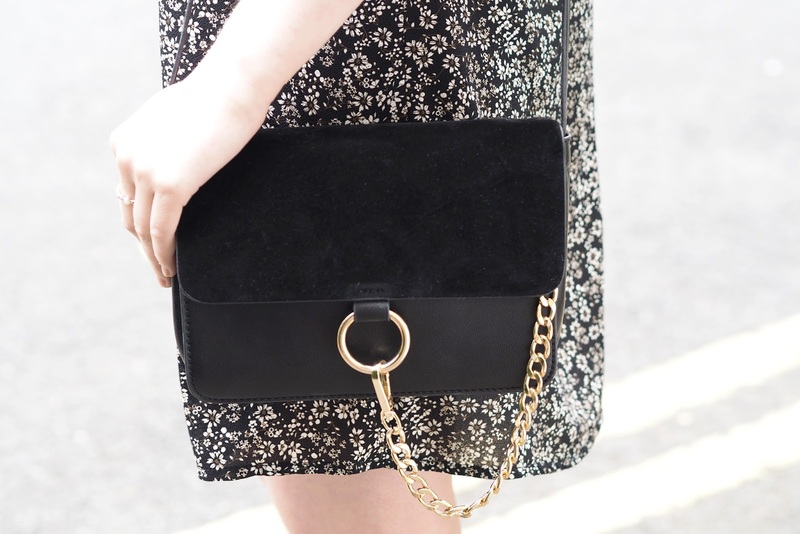 I didn't realise at the time that this style was a dupe of the Chloe Faye bag (which retails at anything from £1280), but I instantly fell in love with it. 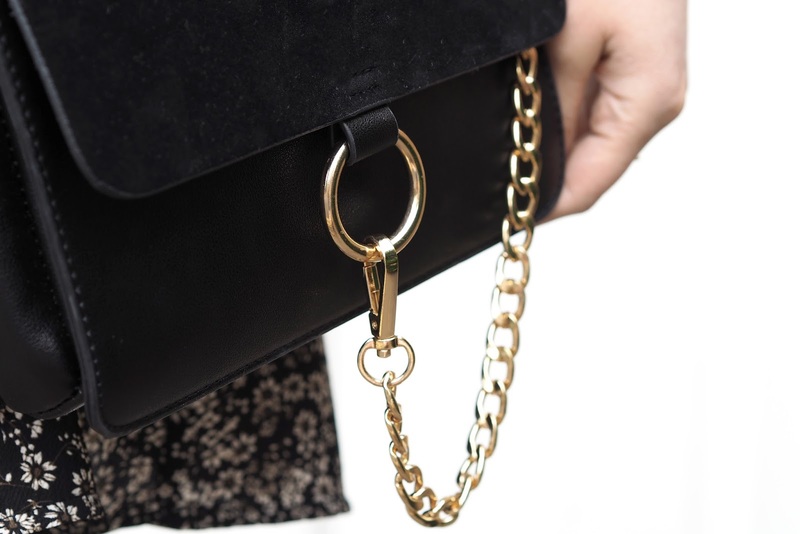 I think it is the simple elegance of the black contrasting with the gold chain that instantly attracted me to it. As unbelievable as it is, this bag only cost me £7.75 and the postage was £6.99, which comes to a total of just under £15. I would never normally spend this little on a bag, because I know that it will inevitably not last. However, I have been so pleasantly surprised by this spontaneous purchase. It came earlier than I had expected (especially as it was coming from China), it was packaged in the most gorgeous protective bag with tissue all around and in a suitably sized box, and finally I've used it pretty much non-stop and I can't complain about the quality. I have no doubt that there will begin to be problems if I over use it, but for under £15 I am so happy with this Chloe Faye dupe. 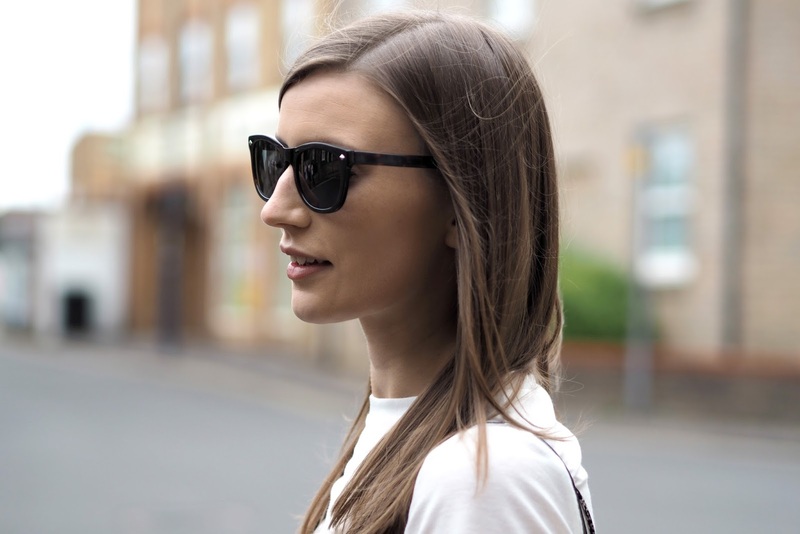 I have seen so many bloggers with either a look-a-like copy, or the real thing, and I think that they all look fab with it. The bag is suited to pretty much every outfit I've put on and it is the perfect 'chuck on' bag for a trip out into the city - day and night. Well done Victoria for finding me this bargain! These photos were taken by the lovely Laura from Loved By Laura on her Olympus Pen camera.